HOLLYWOOD, CALIF. (August 26, 2014) – From director Michael Bay and executive producer Steven Spielberg and in association with Hasbro, Inc., Paramount Pictures’ $1 billion worldwide blockbuster Transformers: Age of Extinction makes its highly-anticipated debut September 30, 2014 on Blu-ray, Blu-ray 3D, DVD and VOD. The film will be available to own two weeks earlier on Digital HD September 16, 2014. The Transformers: Age of Extinction four-disc Blu-ray 3D Combo Pack and three-disc Blu-ray Combo Pack feature more than three hours of illuminating bonus content. From selecting fierce new cars and designing new TRANSFORMERS characters to constructing elaborately detailed sets, this comprehensive footage truly takes viewers inside the fun, hard work and excitement of making an electrifying global blockbuster film. The spectacular Combo Packs also include an in-depth interview with Michael Bay about his approach to the film’s jaw-dropping action sequences, a crash course on the “Bayhem” of being on set for the massive, global production, a revealing look at the design process inside Hasbro Headquarters, and more. Plus there’s even more than meets the eye with the hilarious TRANSFORMERS KREON trailer where KREON figures take you through all of the blockbuster TRANSFORMERS movies. In addition, the Combo Packs include a brand new Angry Bird TRANSFORMERS trailer where birds and pigs turn into Autobots and Deceptihogs, creating havoc on Piggy Island. The Blu-ray 3D includes expanded images as seen in IMAX™ theaters. The Transformers: Age of Extinction Blu-ray is presented in 1080p high definition with English 7.1 Dolby TrueHD, English 5.1 Discrete Dolby Digital, English 2.0 Discrete Dolby Digital, French 5.1 Dolby Digital, Spanish 5.1 Dolby Digital, Portuguese 5.1 Dolby Digital and English Audio Description and English, English SDH, French, Spanish and Portuguese subtitles. The English 5.1 and English 2.0 tracks were each individually mastered to ensure optimal sound for the home entertainment experience. The DVD is presented in widescreen enhanced for 16:9 televisions with English 5.1 Dolby Digital, English 2.0 Discrete Dolby Digital, French 5.1 Dolby Digital, Spanish 5.1 Dolby Digital and English Audio Description and English, French, Spanish and Portuguese subtitles. Bay On Action—In-depth interview with Michael Bay about his vision and approach to the film’s mind-blowing action sequences. Generation 2—A look at where the fourth film picks up as we meet new faces—both man and machine—and a Transformers world after the Battle of Chicago. Drive Like Hell—Two entirely re-envisioned models of OPTIMUS PRIME and BUMBLEBEE appear in the film, along with an intimidating new nemesis, LOCKDOWN, as a Lamborghini Aventador plus other incredibly cool cars including a sophisticated Bugatti Veyron and a sleek Pagani Huayra. Check them out and see how actor Jack Reynor learned how to drive his Sonic rally car for the intense chase sequences. Small Town, Big Movie— When Transformers rolls into some small Texas towns, the normally quiet and picturesque countryside is suddenly alight with explosive action. Explore the different locations with members of the show’s art department and hear from robotics students whose designs appear as part of Cade’s lab. Shadow Protocol Activated— Follow the production to Detroit with unprecedented access to GM’s Lansing plant and Milford Proving Grounds test track; watch an impressive indoor car chase created in an auto parts factory; return to Chicago where location managers discovered a historical movie theater that served as the backdrop for Cade’s fateful first encounter with OPTIMUS PRIME; and finally travel to Washington state and the unlikely site of a never-used nuclear power plant. o The Last Stand—A vacant lot in downtown Detroit is turned into a square block of Hong Kong. Watch as it literally takes shape from the ground up—then marvel as the crew blows it up piece by piece. 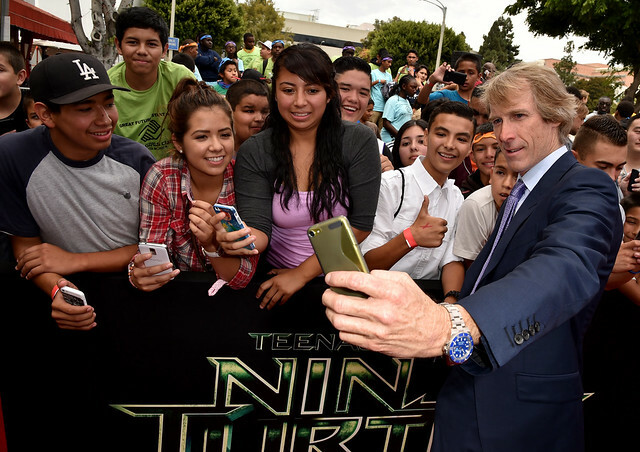 The Finishing Touch— Watch Michael Bay work like you’ve never seen him before. The director connects virtually with his Santa Monica headquarters, visits the editing bay and then checks in on the visual effects house in San Francisco—all from the comfort of his Miami home office. Also, get an in-depth look at the music contributions of Imagine Dragons as they collaborate with the film’s composer Steve Jablonsky. Finally, get exclusive red carpet access to the film’s world premiere in Hong Kong. Just Another Giant Effin’ Movie—Discover the fun, frenetic and amazing way a movie like Transformers: Age of Extinction gets made. A Spark of Design— Enjoy an exclusive look inside Hasbro’s creation of TRANSFORMERS: Age of Extinction Stomp and Chomp Grimlock action figure from concept and development to sculpting and painting, and then ultimately to the assembly line. T.J. Miller: Farm Hippie — Actor/comedian T.J. Miller never imagined he’d be part of a massively successful franchise like Transformers so he sets off to personally thank the people who made it possible. Come along as he visits Bay Films, gets some pointers from Kelsey Grammer, and even stops by Mark Wahlberg’s house in this funny piece. KRE-O TRANSFORMERS: Take Us Through the Movies! – OPTIMUS PRIME will bring you up to speed on all of the TRANSFORMERS movies one by one in this hilarious, animated short where the TRANSFORMERS KREON figures act out the movies while building and rebuilding each scene…brick by brick. The Angry Birds TRANSFORMERS: Origin Story – Bonus content tells the origin story of how the EggSpark has landed on Piggy Island causing the eggs on the island to turn into evil Egg-bots, wreaking havoc across the whole island. The EggSpark has also caused the Birds and Pigs to turn into Autobots and Deceptihogs, who must team up in order to stop the Egg-bots before it’s too late! The Blu-ray 3D Combo Pack includes all of the above, as well as a Blu-ray 3D with expanded images as seen in IMAX theaters presented in 1080p high definition, English 7.1 Dolby TrueHD, English 5.1 Discrete Dolby Digital, English 2.0 Discrete Dolby Digital, French 5.1 Dolby Digital, Spanish 5.1 Dolby Digital, Portuguese 5.1 Dolby Digital and English Audio Description and English, English SDH, French, Spanish and Portuguese subtitles. The English 5.1 and English 2.0 tracks were each individually mastered to ensure optimal sound for the home entertainment experience. The Blu-ray 3D Combo Pack and Blu-ray Combo Pack available for purchase include a Digital Version of the film that can be accessed through UltraViolet™, a new way to collect, access and enjoy movies. With UltraViolet, consumers can add movies to their digital collection in the cloud, and then stream or download them—reliably and securely—to a variety of devices. The Transformers: Age of Extinction DVD is presented in widescreen enhanced for 16:9 televisions with English 5.1 Dolby Digital, English 2.0 Discrete Dolby Digital, French 5.1 Dolby Digital, Spanish 5.1 Dolby Digital and English Audio Description and English, French, Spanish and Portuguese subtitles. The disc includes the feature film in standard definition. Congratulations to Michael Bay, Mark Wahlberg, Steven Spielberg, Lorenzo di Boneventura, Ian Bryce, Hasbro, and the entire cast and crew on this billion dollar global blockbusters. And last but not least, a great thank you for all of our fans.